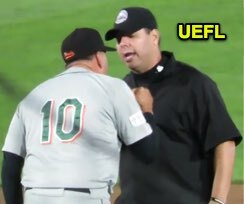 As the Atlantic League postseason seeks a Liberty Division champion, 2B Umpire Jorge Teran ejected Long Island Ducks Manager Kevin Baez (safe call [pulled foot]) in the bottom of the 6th inning of the Ducks-Patriots game in Somerset. With one out and one on (R1), Patriots batter Craig Massey hit a ground ball to Ducks pitcher Jose Cuas, who threw to shortstop Dan Lyons as Patroits baserunner R1 Yovan Gonzalez arrived at second base, ruled safe due to Cuas' wide throw pulling Lyons off the base. At the time of the ejection, the game was tied, 3-3. The Patriots ultimately won the contest, 8-4.